In anticipation of the Risk/Reward Festival next Saturday (June 19 @ BodyVox), we’re presenting daily profiles of the artists involved. 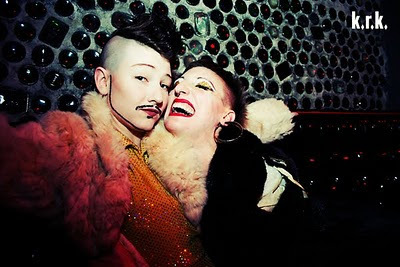 Today it’s The Cherdonna & Lou Show (performing in the 8pm showcase). The Cherdonna & Lou Show is the brainchild of Seattle dancers Jody Kuehner and Ricki Mason. Jody and Ricki invented The Cherdonna and Lou Show to combine their choreographic backgrounds with their desire to create comedic politicized and personal performance. Cherdonna and Lou combine brains, brawn, and contemporary dance moves (and celebrities, and the artifice of drag) as they lip sync, piano sync, and tap sync their way through the decades in no particular order. We are here to entertain you. And then maybe give you a different kind of feeling then being entertained, like sadness or fear, and then maybe your feelings will make you think about things during the show or even afterwards over cocktails. You’re not allergic to cats, are you? Cherdonna and Lou are an absolute delight to watch onstage. Their performance exposes a flawed narcissism and humiliation through two personas that are simultaneously hilarious and endearing. Their playful, precise choreography and wildly contrasting body types inject a refreshing simplicity to the world of high art, while subtly sending very powerful messages about the roles we all put on and portray for the benefit of the world around us. You can check out excerpts from their show here and see the video On the Boards put together about their “costume inspiration” here. We can’t wait to let them flaunt their “cluelessness via odd-couple dancing and mumbo-jumbo musings, to hilarious and pathetic effect” all over Portland.